Uni (sea urchin) on a bed of crispy asian pear, tangy grapefruit and yuzu dashi gelee. A simple Japanese inspired appetizer that will impress your dinner guests. This doesn’t happen often, but I’ve been at a total loss as to what to name this dish. It’s not quite a salad, not quite a ceviche, and not quite a terrine. Sure, I could have just stretched the definition a bit to fit the dish, but it always irks me when people go naming things loosey goosey after dishes that have a long illustrious tradition. It’s a kind of cultural defilement that’s akin to calling street graffiti art. Salad’s are typically an assortment of chopped vegetables covered in dressing, neither of which holds true for this dish. A ceviche is a citrus cured seafood dish originating in Peru. While this dish is definitely citrusy and tangy, the uni never sits in the citrus juice, and the last time I checked, Asian Pear and Grapefruit weren’t exactly native Andean crops. These ingredients are all quite Asian (grapefruit is a descendant of the South East Asian fruit Pomelo), but the preparation is definitively un-Asian. A real enigma indeed! Out of ideas, I reached out to my friends in Twitterland for suggestions. There were some amusing suggestions — “Asian melange to die for” and “Golden Summer Paradise” where two that come to mind — but none really captured the spirit of this dish. I decided that I just needed to go with a plain ole’ descriptive name which is how I came up with: “Golden Pacific Uni Atop a Bed of Crispy Asian Pear, and Ruby Red Grapefruit Segments with a Yuzu Dashi Gelée”. But like a kid with a long first, middle, and hyphenated last name, it was a bit too unruly and I nicknamed it “Uni with Yuzu Gelée”. I hope I haven’t lost you amidst my long naming saga, because despite its identity crisis, it’s a real gem for anyone who likes uni. The sweet and tangy fruit keeps the unctuous uni in check while the umami laden gelée literally acts as the glue that holds these complimentary ingredients together. 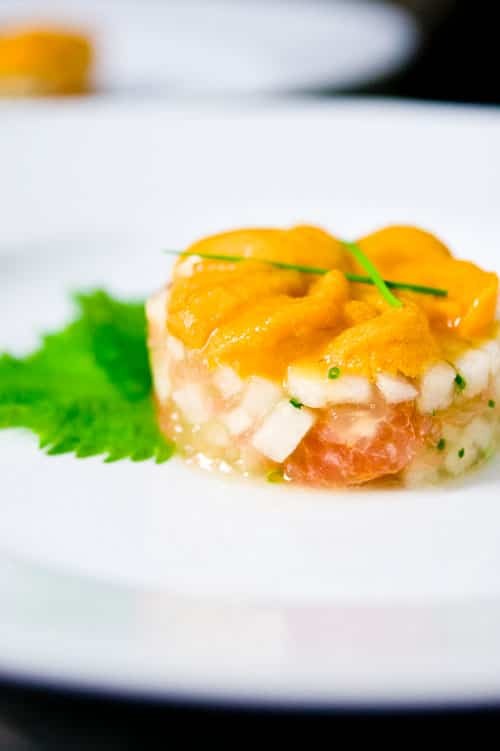 The mild bitterness of the grapefruit and the garlicky chives keep your tastebuds interested and ready to accept the next bite of heaven. If uni isn’t your cup of tea, don’t worry, it wasn’t mine either up until recently. I could see the fruit and gelee going well with yellowtail, snapper, or amberjack sashimi. It might even play nicely with a seared and thinly sliced rare steak (reminiscent of my warm beef salad). Replace the chives with some mint and you’d have a nice accompaniment to lamb. The possibilities are endless. Add the water to a small ramekin and sprinkle with gelatin. Let it rehydrate for a few minutes. Put the ramekin in a microwave and zap for about 20 seconds or until it just starts to bubble (careful it will boil over quickly). Add the melted gelatin to the dashi, yuzu juice and salt, stirring to combine. Cover and refrigerate until set. To make the salad, just add the pear and grapefruit into a bowl. Use a fork to crumble up the set gelatin and add it to the fruit. Sprinkle with the chives and gently mix together. Using a 2.5" round ring mold (I used a round cookie cutter), put down a layer of the fruit and yuzu gelée. Top with uni in a spiral pattern and remove the ring mold. Left arm or right? Pick one, it’s yours. Will trade for uni and yuzu. P.s. Where do you find fresh yuzu juice? How about you just come over and use both arms to cook me some porkcheek chimichurri:-) As for the yuzu juice, I used bottled juice. It’snot quite the same as fresh, but it’s not a bad substitute either. I was going to amp up the pretense and fling the term brunoise into the pool, but it turns out they are much smaller than the dice you have here. Oh well (learned something too). Gelee works very well. I suppose you could call it an aspic because of the presence of stock, but that might freak out people. But then again, I like very descriptive names. You could make it eponymous – a “Matsumoto” or something. Left arm or right? Pick one, it's yours. Will trade for uni and yuzu. P.s. Where do you find fresh yuzu juice? How about you just come over and use both arms to cook me some porkcheek chimichurri:-) As for the yuzu juice, I used bottled juice. It'snot quite the same as fresh, but it's not a bad substitute either. You finally had a name for this dish. Uni still has an acquired taste. I might change my mind after tasting this. Except that I have to change the yuzu (which is not available) for something else. When I don’t know how to call a dish, I usually give it a name like Robert or Norman. This looks too beautiful for such names, though. I think you went with the right name. Wait, how about Edgar? Horace? Okay, fine. Now this sounds interesting! What a creative dish! And how beautifully you have photographed it!! Hah! Love the naming saga – it’s a struggle sometimes trying to find something that captures the essence of the meal while also being descriptive. This meal ROCKS. Uni + Yuzu? I think I’m in looooove! Beautiful. I love uni and you make this sound so simple (other than naming it – lol). Can’t wait to try it. When I don't know how to call a dish, I usually give it a name like Robert or Norman. This looks too beautiful for such names, though. I think you went with the right name. Wait, how about Edgar? Horace? Okay, fine. Hah! Love the naming saga – it's a struggle sometimes trying to find something that captures the essence of the meal while also being descriptive. This meal ROCKS. Uni + Yuzu? I think I'm in looooove! Beautiful. I love uni and you make this sound so simple (other than naming it – lol). Can't wait to try it. I could really go for this light and clean dish right now… Yum! I LOVE UNI! I go to the fish markets on most weekends and have it with just wasabi and soy! Plain is good but your salad/ceviche/terrine – well, that’s in a league of its own! Just gorgeous. I LOVE UNI! I go to the fish markets on most weekends and have it with just wasabi and soy! Plain is good but your salad/ceviche/terrine – well, that's in a league of its own! Just gorgeous. wow. I’m stunned, this looks beautiful! wow. I'm stunned, this looks beautiful! Whatever you call it, it looks very interesting! Beautiful colors and presentation, I just don’t know what to think of it I don’t think I’ve ever had anything close to this. Definitely worth a shot, wonderful dish! Whatever you call it, it looks very interesting! Beautiful colors and presentation, I just don't know what to think of it I don't think I've ever had anything close to this. Definitely worth a shot, wonderful dish! you have no idea how much i love uni! so you can imagine my heart skipping a beat when i saw this on tastespotting. nicely done! Great concept of your blog. I would say the same too, the only time you really need recipes is if you’re baking. I do have both a food blog, an online cooking show and I’m a published cookbook author. And I love to cook! But for myself, I never use recipes. I get ispired by them but it is not the recipe in itself, it is more the looks of it/the ingredients. Great concept of your blog. I would say the same too, the only time you really need recipes is if you're baking. I do have both a food blog, an online cooking show and I'm a published cookbook author. And I love to cook! But for myself, I never use recipes. I get ispired by them but it is not the recipe in itself, it is more the looks of it/the ingredients. Love savoury gelees……and this is no exception. yes. yes. getting some uni tomorrow and throwing down in the kitchen on this one for sure! Looks divine! I love uni!